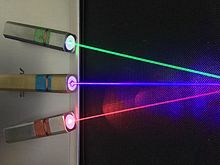 A laser pointer (or laser pen) is a small device that shines a low-powered laser light. The pointer is usually powered by a battery. It contains a laser diode that emits a very narrow laser beam of visible light. When pointed at an object, it shines a small bright spot of colored light. The pointer is held in a hand. It is used to highlight something of interest. Power is restricted in most jurisdictions not to exceed 5 milliwatts. This page was last changed on 12 February 2017, at 02:45.